Woodworking can be a safe and enjoyable hobby or vocation if you follow some basic woodworking safety rules. All of the rules are common-sense ideas, but failure to follow these rules will greatly increase the chance of injury when working with your tools. The wood shop is not the place to be in a hurry or have an "it won't happen to me" attitude. Commit these 10 rules to habit and your woodworking experiences will be safer and much more enjoyable. The first and most important rule of woodworking is to wear appropriate safety equipment. 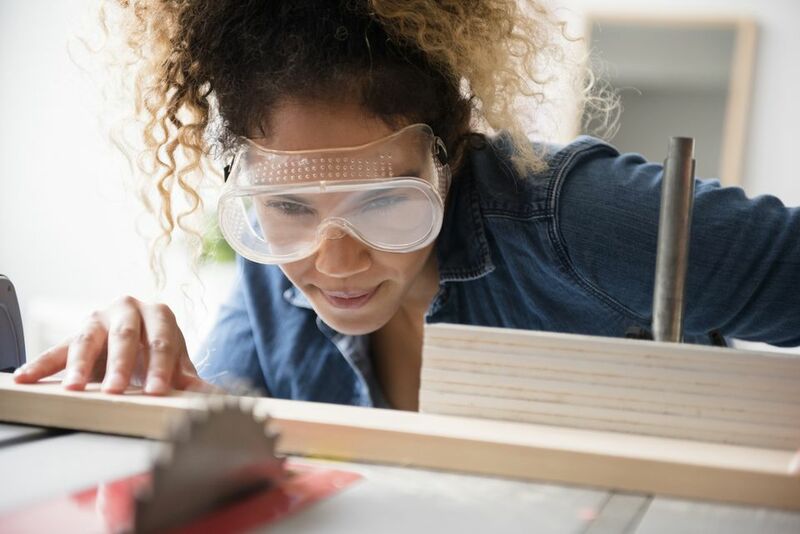 While hearing protection is necessary for some very noisy tools such as routers and surface planers, and latex gloves may be necessary when applying finishes, there is no time in the wood shop that you should be without your safety glasses. Put them on when you enter the shop and don't take them off until you leave. Whenever working in the wood shop, remember to avoid loose-fitting clothing, as you wouldn't want any of your attire to become entangled in a saw blade or cutting head. Wear clothes that are comfortable for the environment in which you're working, but also will protect your body from any wayward wood chips that might result from cutting. Before beginning, remember to remove any dangling jewelry such as neck chains or bracelets. Intoxicating substances and woodworking are a dangerous mix. Stay out of the wood shop if you are even remotely under the influence of any intoxicants. While it may seem harmless for the weekend woodworker to crack open a beer (or six) while working on a project, avoid the temptation until you're finished with the woodworking. You're going to be much less likely to encounter a problem if you're clean and sober when working with your power tools. Whenever you need to change a blade or bit on a power tool, always disconnect the electricity to the power tool before even beginning the blade change. Many a woodworker has lost fingers (or worse) by forgetting this simple but very important rule. Use one heavy-duty extension cord. Not one per tool, but one total. This way, you're forced to switch the cord from tool to tool before the tool can be used. In this manner, you are always remembering to plug and unplug the power when moving from one tool to another, and you'll be more cognizant of the need to disconnect the power when making bit or blade changes. This one seems like a no-brainer, but a dull cutting tool is a dangerous tool. If a saw blade is not as sharp as it ideally should be, the tool and the woodworker will have to work harder to complete the desired task. In such cases, the tool will be more likely to kick-back or bind. Besides, a sharper cutting tool will produce a cleaner cut, so there are more than just safety advantages here. Keep the blade sharp and clear of pitch and you'll be safer and have better results. Always check the stock you're preparing to cut for any metal (nails, screws, staples, etc.) before beginning a cut. Nails and rapidly spinning saw blades are not a good mix. Not only can this damage the cutting head and the stock, but at the very minimum, can cause the stock to kick back, which is a common cause of injury. Inspect the stock (or better yet, use a metal detector) before cutting. Woodworking power tools are designed so that the direction that the wood moves through the tool (or the direction that the tool moves across the wood) is in the opposite direction of the movement of the cutting head. In other words, a router bit or saw blade should cut against the motion and not with it. The cutter should cut into the stock, not with the stock. When working on a table saw, miter saw, etc., never put your hands anywhere near the moving blade, especially when attempting to remove waste or cut-offs. Wait until the blade has stopped moving and then reach for the cut-off. Better yet, once the saw blade has stopped, use a piece of scrap or a push stick to move the waste away from the blade. Remember that switches can be inadvertently bumped or malfunction, so just because the blade has stopped, don't relax and put your hands too close. Distractions are a part of everyday life, and working in the wood shop is no different. When you are summoned or distracted while in the middle of performing an action with a power tool, remember to always finish the cut to a safe conclusion before dealing with the distraction. Taking your attention away from the woodworking tool is a recipe for disaster.